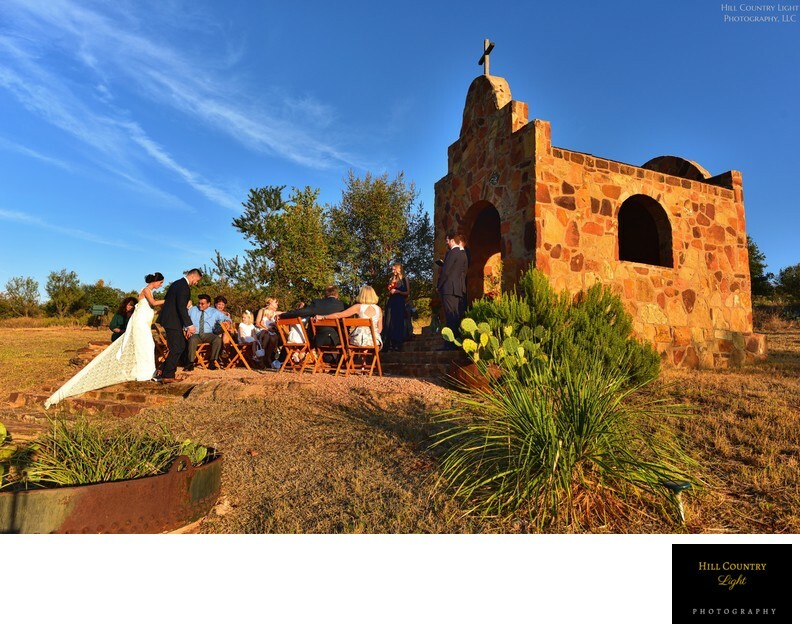 The Hill Country is blessed with dozens of amazing locations for weddings and special events. 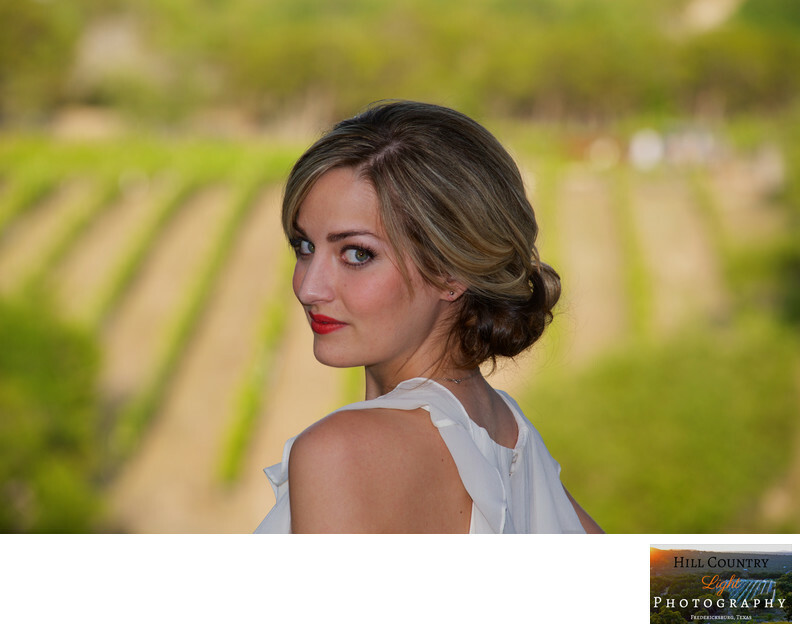 I have photographed weddings and celebrations at private homes, ranches and a few of the more well known venues. Here are a few ideas for you. Featherstone Ranch, Stonewall. 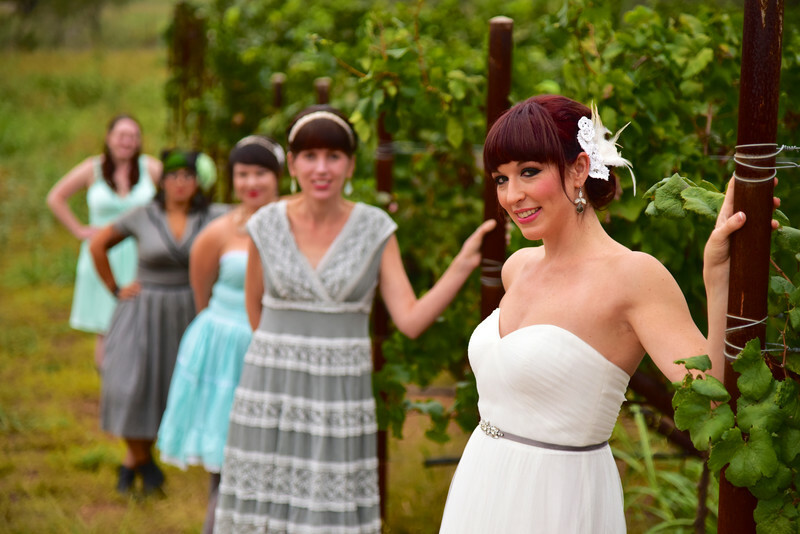 Located behind LBJ Ranch, and close to many top wineries on Wine Road 290, Featherstone is new for 2017, a premiere venue for large weddings and events. Featherstone is run by Claudine Clark -- she has decorated and supported dozens of Hill Country Weddings. I love the oak grove as a ceremony site, with live oaks, fencing and open space. The main facility is grand, with a centerpiece chandelier and dramatic drop lighting over the corner bar area. Seating could be for 150 or more. An outdoor patio graced with string lights and shaded by red oaks will keep things lively for evening receptions. The bridal suite has a 20' mirror, wine fridge and three stations, while the grooms room features couches and a big screen TV. They thought of everything! Check out the website -- most of those images are mine as they prepare for wedding season in the Spring of 2017. Tres Lunas Resort, Mason. Tres Lunas reminds me of Taos. Located west of Fredericksburg on the road to Mason, this remote resort is intimate, serene, and beautifully situated. On-site catering, a few rooms, bridal lodge, courtyard infinity pool and spa, and a beautiful chapel give this place a special feel for a small wedding. And perfect for Elopements! Happy H Ranch, Comfort. Large, beautiful, versatile facility. I enjoyed shooting here because the view from the top of the Cross Hill is unparalleled in this part of the hill country. The covered pavilion with high vaulted ceiling has direct access to adjacent grounds including fire pits and stonework. Located on Highway 87, a couple miles north of Interstate 10 exit for Comfort. 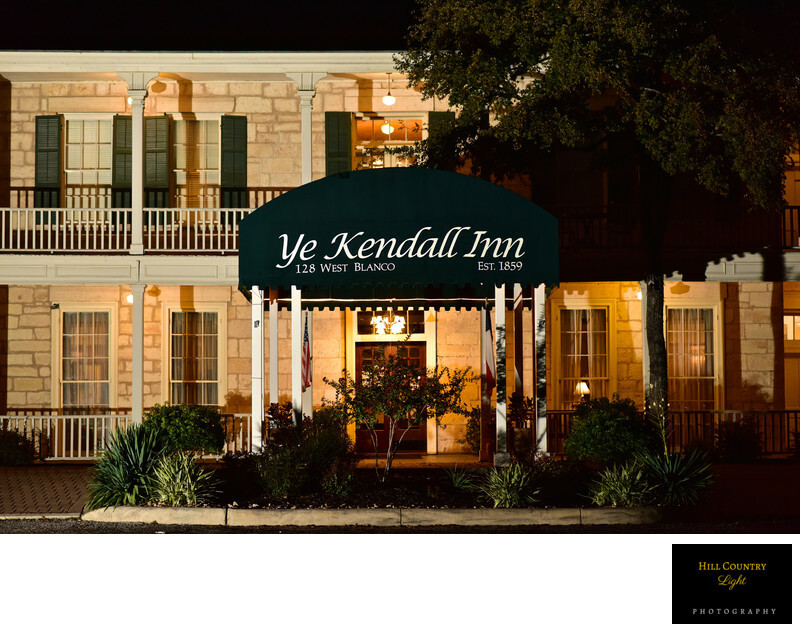 Kendall Inn, Boerne. Lovely hill country hotel with banquet room-style hosting facilities, the best part of the Kendall is the stone patio with large outdoor fireplace and light strings. That is a shared/common area shared with hotel guests, but it's large enough to do portraits and family shots. Located in downtown Boerne. Hawk's Shadow Winery, Dripping Springs. 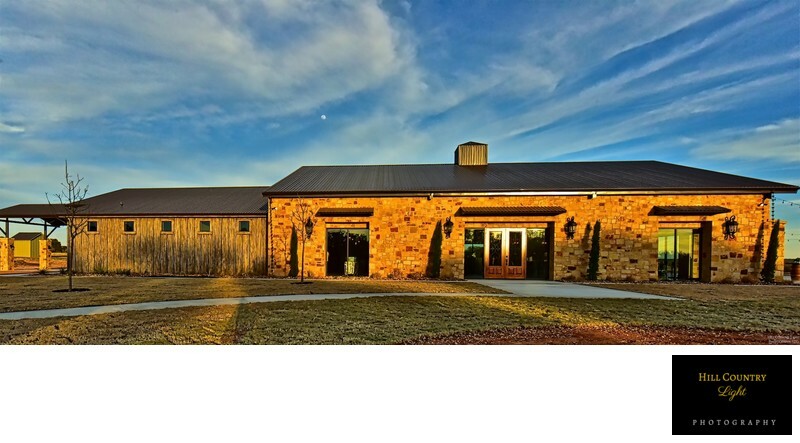 Newly opened in 2014, this winery lies in the hills just north of Dripping Springs. The owners are building a large tasting room and new winery as I write this. They have received numerous inquiries for small weddings or rehearsal dinners where you would bring your catering, tables, supplies, etc. One visit and you will see why this winery is going to be a special place for a special day -- the view is incredible, and the wine & hospitality are equally grand! Located on McGregor lane about 10 miles north of Dripping Springs. You will need a map but the reward is worth the drive. William Chris Vineyards, Hye. 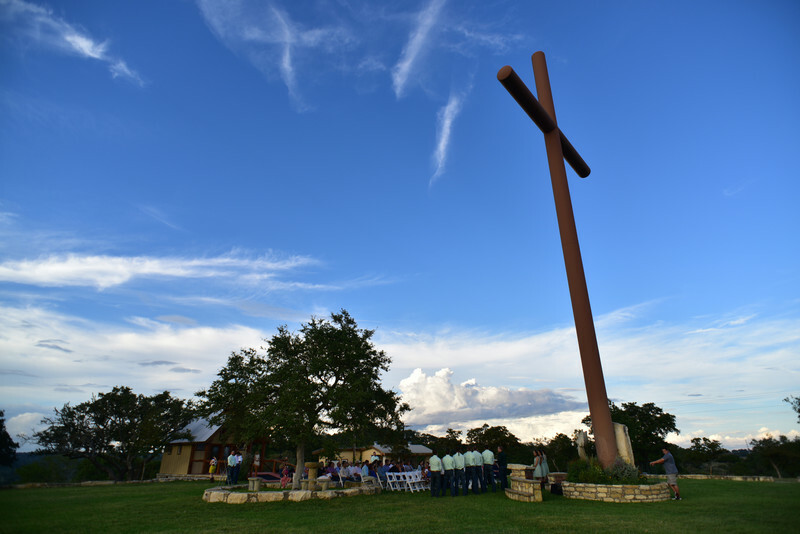 One of the most beloved wineries in the Hill Country, William Chris hosts a few weddings on occasion, typically for wine club members or very special guests. The setting is idyllic - farmhouse tasting room, lights strung between large oak trees forming a beautiful canopy for any dinner, adjacent to newly planted vineyards.